Last month, my husband’s friend gave him a sample of some homemade granola he made. Since then, we have been on a granola kick! If you have never made homemade granola before, you have to give it a try. Besides being super easy, you really have a lot of control over what goes into it. We have a lot of fun experimenting with different ingredients and flavors too! 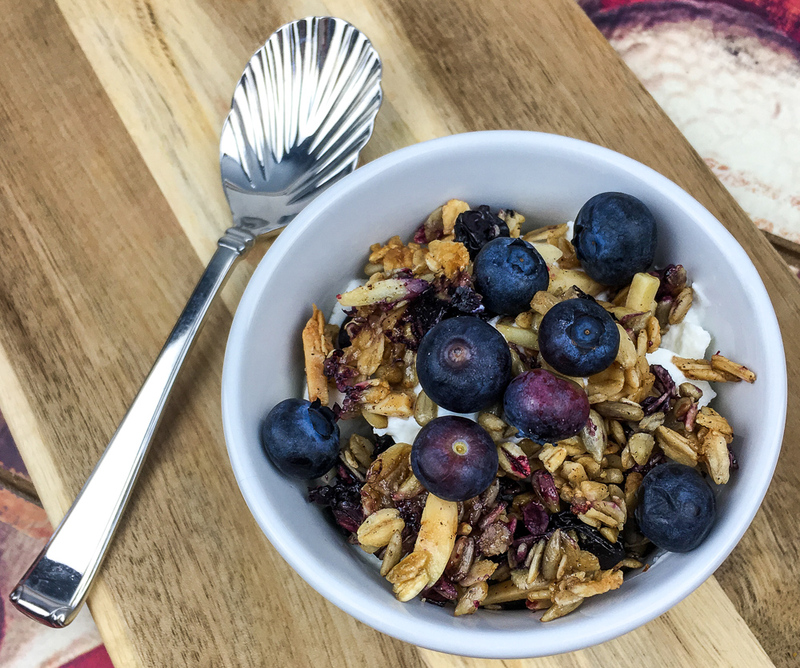 I’ve been enjoying my granola every day with plain or vanilla greek yogurt, some fruit like blueberries or bananas and then a few heaping spoonfuls of granola. In a large mixing bowl, whisk maple syrup, and vanilla extract until combined. Add the oats, almonds, sunflower seeds, dates, cinnamon, and salt. Stir until the dry ingredients are lightly coated in the mixture. Spread the granola into a thin, uniform layer onto the prepared baking sheet. Remove from oven and cool completely. The granola will become nice and crispy as it cools. Once cooled, serve with Greek yogurt and fresh blueberries or sliced bananas. Enjoy! Be sure to scroll down to get the full printable recipe! Yum! What a fantastic recipe here. I would definitely be snacking on this during the day. Now that is a great breakfast/snack! I’m a big fan of granola, but I’ve never tried making it. This looks like it would be worth the effort! I can only imagine how good homemade granola is. I never tried making it, so simple, I want to give it a whirl!